'01959 53' numbers connected to Knockholt BT exchange - postcode TN14 7.. The KCC and BT "where and when" websites are still to be updated, but if you contact your ISP they can see that you can now upgrade to an FTTC connection and you can place your order. BT's Availability Checker does reflect the new live status - see image below. If you are close enough to the new cabinet your speeds may improve from around 3Mbps to 80Mbps! I've been asked a few times if anything has to be done to get the new fibre-based broadband service once it's available. The answer is 'yes'. After contacting your chosen ISP (it doesn't have to be BT!) you would have to signup for their FTTC package - normally more expensive than standard ADSL. At the moment most new installs are carried out by an Openreach engineer with self-install options just being introduced. New equipment is also required - possibly a new Master Socket faceplate, VDSL modem and router. For people that don't upgrade to the new fibre-based broadband their standard ADSL service will continue as normal. The table below is an unofficial guide to possible expected FTTC speeds. the length and quality of the phone line between the cabinet and your home as well as your internal phone wiring. Also the ISP package - some packages are 'up to' 80/20 or 40/10 etc. The current broadband speeds around Badgers Mount are no more than around 6Mbps (with many properties getting a lot less) so FTTC should make quite an improvement. The updates below show how things are progressing. 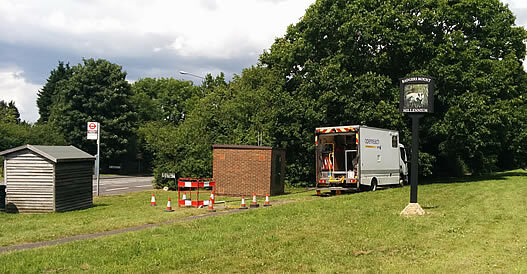 7th July 2014 - Fibre cable being installed by BT Openreach - A224 roundabout. Description : Road closure for bduk fibre cabling." Both cabinets are along the A224 Orpington Bypass close to Crest Close. 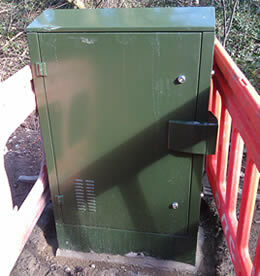 This week our fibre cabinet (FTTC) has been installed along the footpath running from Crest Close to the A224. BT/KCC seem to be ahead of the original schedule which is good to see. "The project will be delivered in 8 phases - with the first services being available in early 2014. It is anticipated that the network build will be complete by December 2015." See the KCC website for full details. Knockholt BT Exchange (serving Badgers Mount, Halstead & Knockholt) is scheduled to be upgraded in Phase 2 - with work starting between April and September 2014. KCC have provided a postcode checker and published coverage maps for the Kent broadband upgrade. NOTE: Please see the KCC site regarding why this plan may change and for coverage estimates etc. I seem to be the only one still using this though!?! KCC have published a broadband project update: "Making Kent Quicker Update: July 2013"
You can download KCC's PDF here. "One of the biggest infrastructure projects in Kent’s history will start this year as better broadband is delivered across the county by Kent County Council and BT. Announced today, the partnership is backed by £10m of council funding £9.87m from central government and £19.6m from BT. The contract, which is being signed today, follows the enormously successful ‘Make Kent Quicker’ campaign, which saw thousands of people sign up and say they wanted more from their broadband..."
As this page is proving quite popular I thought I should add an update - lots of local people with slow broadband no doubt! KCC's Broadband Survey has been running for over a year now. "We are currently analysing the demand data to find out which areas don't have faster broadband and which areas want it..."
This page will be updated when a decision is announced which shouldn't be too far away as many of Kent's neighbouring councils have now made their Superfast Broadband announcements. KCC Survey Link: Vote for better broadband! Use the above link to read details on KCC's online survey to gauge interest for faster broadband in our area. When will 'Fibre' Superfast Broadband be available in Badgers Mount, Halstead & Knockholt ? BT Infinity is BT's fibre based broadband but many other ISPs also have fibre options. BUT they are all dependent on the local exchange being upgraded. Our local BT exchange is Knockholt and isn't currently in BT's rollout plans! You can also 'register your interest' in Superfast/Fibre broadband using the above link. "Future Exchange - Forecast date: Calendar Year 2014". The first LLU provider at Knockholt! TalkTalk (CPW) currently has an RFS (Ready For Service) date of 30/11/2011 making it the first ISP to offer ADSL services using non-BT Exchange equipment (Local Loop Unbundled) at the Knockholt exchange. This RFS date has now passed and TalkTalk LLU should be available/live soon. LLU ISPs are often able to offer more competitive Broadband and Phone packages which may suit some people. But it's worth noting you still often get what you pay for! *Archived BT FTTC 'Race to Infinity' notes below* - kept for reference. 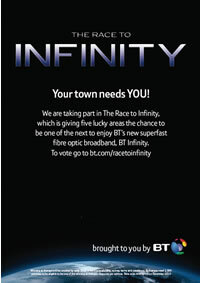 The 'BT Infinity FTTC Race' has now ended (31/12/2010). Faster Broadband for Knockholt Exchange! - and £5000 from BT for a local community project. BT's Knockholt Exchange supplies phone services to a total of 1737 lines/properties. 1,614 residential premises and 123 non-residential premises. Many people in our area on Broadband/ADSL are a long way from Knockholt Exchange which means that their broadband connections will run quite slowly. The closer you are to the exchange the higher your connection speed will be. So those in Knockholt will get the best speeds followed by Halstead and then Badgers Mount and Well Hill. The Badgers Mount website was part of the previous campaign back in 2003 to help get Knockholt exchange upgraded for ADSL. Along with representatives from Knockholt and Halstead leaflets were delivered to all properties in the area encouraging people to 'register an interest' with BT. When the trigger level set by BT of 300 people was reached the exchange was given a date for it's upgrade. 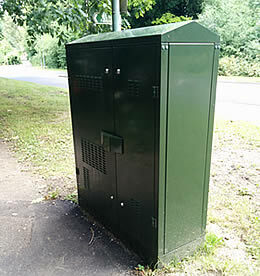 BT Openreach have started to upgrade the infrastructure by replacing the old copper wires connecting the green street cabinets to the exchange with fibre optics. This new service is known as FTTC (Fibre To The Cabinet). It's effectively bringing the exchange closer to peoples homes. The connection from the green street cabinet to the house still uses the normal copper phone line. At the moment the fastest broadband you can get while connected to the Knockholt exchange is an 'up to' 8Mb product. FTTC offers 'up to' 40Mb download and 10Mb upload. The benefit of using fibre is that there is minimal signal loss over long distances unlike the current copper/aluminium phone lines. With over 5500 exchanges in the country this work will take years to complete. As with most things, the upgrades are being rolled out where BT think it makes commercial sense. Sevenoaks Exchange is scheduled for 2011 with no planned date for Knockholt. BT Retail's fibre product is called BT Infinity - other providers also offer FTTC Broadband. 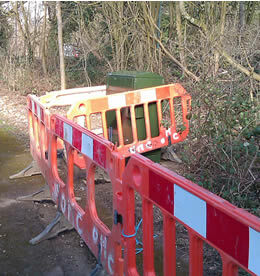 But all the products are dependant on BT upgrading the copper to fibre between the street cabinets and the exchange. Today (4/10/2010) BT have announced a competition where a handful of exchanges will be upgraded if enough interest is shown. It looks to be mostly a marketing stunt as the odds on getting Knockholt chosen are pretty slim - BUT perhaps if there is still a fair bit of interest it will register with BT and move us up the list of eventual upgrades! To be accepted the exchanges have to have over 1000 lines (Knockholt is 1737) and have a least 1000 'votes'. Back in 2003 we managed to get 300 which was then the requirement for normal broadband so achieving over 1000 could be asking a bit much. But perhaps as a close knit community Badgers Mount, Halstead, Knockholt and Well Hill do stand a chance against some of the larger exchanges as it might be easier to get the message out to residents and businesses and the competition is based on a percentage of votes. BT have created a website where people can vote or register an interest in FTTC and have the chance of getting their local exchange upgraded. if reproducing the above content. Do you want faster broadband where you live? BT is rolling out superfast fibre optic broadband across the UK. Whether you’re big on social networking, gaming or streaming video, with download speeds of up to 40Mb* your life will be transformed. Winning exchanges will be enabled by early 2012 subject to availability, survey, terms and conditions. Exchanges need 1,000 premises to be eligible to be one of the winning exchanges. One vote per address. Race ends midnight 31st December 2010. *Top speeds affected by various factors including distance from the cabinet and internal wiring. **£5000 of computer equipment will be given to a community project of BT’s choice. Once winning exchanges are announced submissions from the local community will be called for and judged by BT. NB. I happened to be the first person on Knockholt Exchange to vote! For reference: Original successful BMRA Broadband Campaign notes from 2003.
ensure your internal equipment doesn't effect your broadband connection. 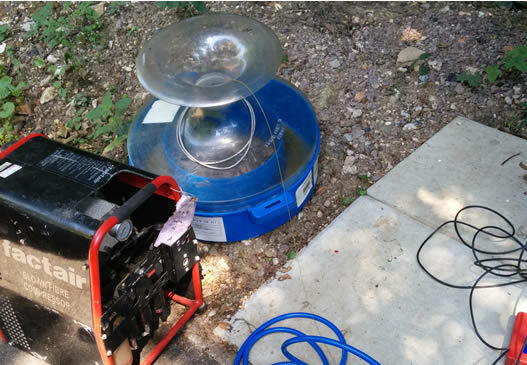 Improves broadband stability by reducing interference from your extension wiring.